Jason Collier joined Rich & Cartmill, Inc. in 2014. 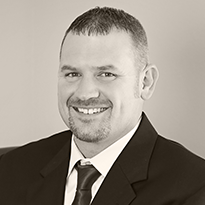 Prior to joining Rich & Cartmill Jason had spent the prior ten years with Thomason Tyler & Lynch Insurance Agency. Jason graduated from the University of Tulsa in 2004 with a degree in Management Information Systems and a minor in Economics. Jason attended Tulsa on an athletic scholarship. Jason specializes in commercial and personal insurance working with his clients to find the right coverage for their needs. Jason enjoys working with people to help educate them on the needs of a startup business or growing and expanding business. Jason has been married to his wife Kari for 11 years and they have two children Macey and Hunter. Jason is a member of Oak Grove Baptist Church where he servers on the future planning committee. In his free time Jason enjoys coaching his children’s teams, hunting, fishing, and the outdoors with his family.